Paul is the Center Star! I love my guy. I really do. 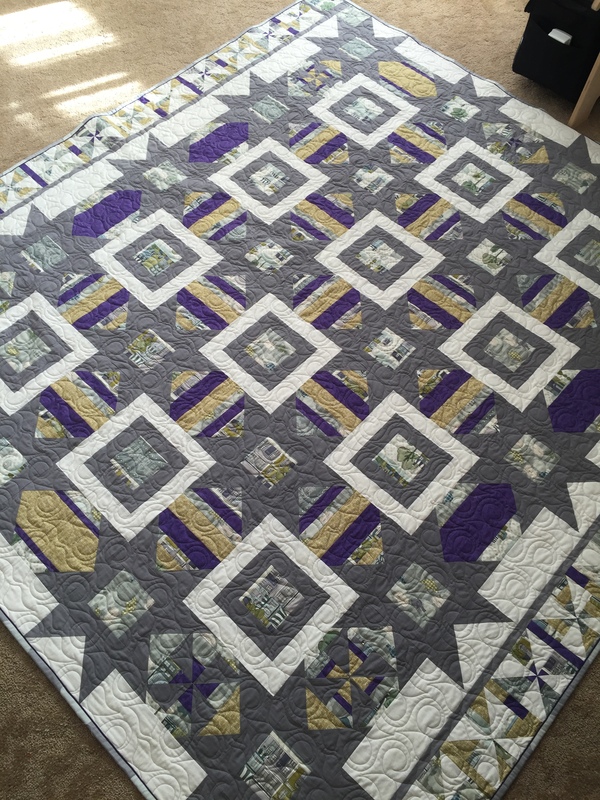 It’s just that I was a bit intimidated about making his quilt … for over 2 years. OK, here’s my confession: I’m super, super proud of this quilt!!! It’s definitely traditional, and even (mostly) came from a pattern and kit, but dang! It’s cool. I took my time (and lots of stitches out). The points are sharp and it lays flat. That all may not be a big deal to some, but it’s a a bit of an accomplishment in this house. It can be found in the Spring 2013 edition of Primitive Quilts. The border was made from the scraps using a Pinterest pattern using half square triangles. In Sep 2013, Paul found this quilt at the Quilt Expo. I said, Sure, it’s just squares and triangles, I can do that. After we got it home, and after reading the instructions, I got scared. So the material sat. And sat. When we moved, I packed every other quilty project or potential project to force some progress on this. It worked and the center start was pieced! That was March 2015. After the move, it once again sat. At the end of my cutting table. For months. But here’s the thing: I’m glad I procrastinated. This quilt needed to be my best. I needed to be confident and careful. I needed to have a better relationship established with my Seam Ripper. (We are now besties!) This is my Masters degree thesis paper. And I was making it to impress my favorite professor. After over a year of telling her monthly that I was getting close, Cindy Hasse finally received the top in December and called for pick up this month!! I had been admiring her quilting for years and knew from the beginning that she was the one who should quilt this one. She did a beautiful job!! The borders are my favorite with the graphic edges. And she replicated the border pattern in the stitching. How cool!! With a red binding to frame it all, the quilt is done!!! Now begins the process of crossing off items from the #2016sewmystash list. There are 18 remaining projects for 2016. To start things off, I pieced Paul’s Center Star and sent it off to be quilted. I’ll post when it’s done. 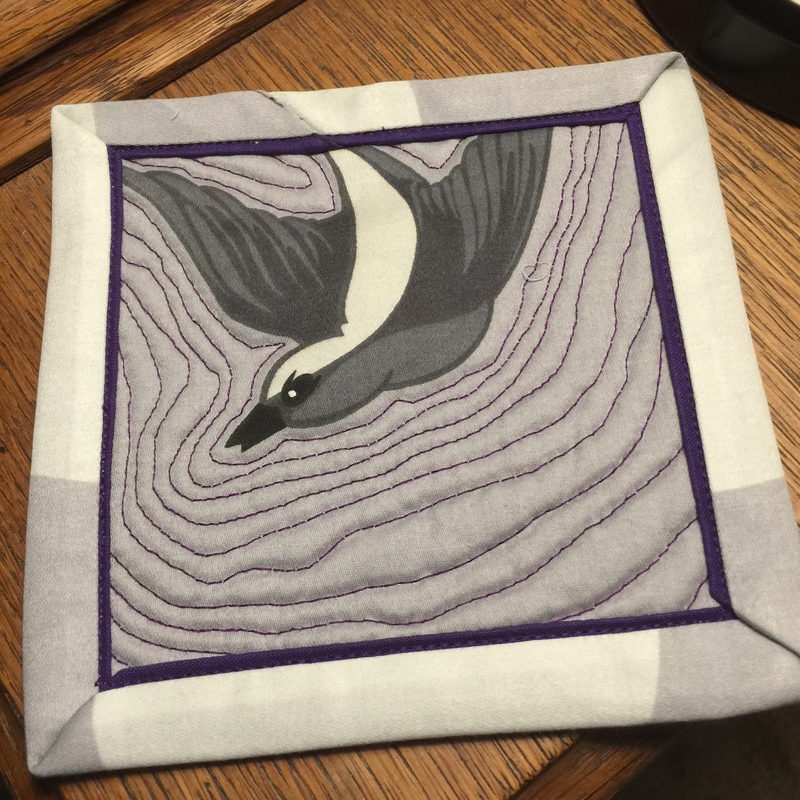 This post is about the first completed project: My City Birds quilt. The fabric was bought at the Quilting Expo in 2014 from Pineapple Fabrics as a pre-cut Pineapple Pack 5.0 (squares, strips, and fat quarters). The fabric line is “The Neighborhood” by Andover Fabrics. I bought the pack as somewhat of a challenge to see if I could do something with all of the material in the pack. Challenge has been met! Only one or two small pieces were remaining. The pattern is called Stars and Stripes and can be found in the book “25 Ways to Sew Jelly Rolls, Layer Cakes, & Charm Packs” by Brioni Greenberg. To use up the scraps, I made pinwheels to border 2 sides. Once it was pieced, the quilt visited Gael Boyd’s home (Stitchlilly) to get some TLC … and stuffing and stitches. She added some super cute birds to hold the top to the Tula Pink Free Fall backing. I have to say: the Free Fall backing fabric is just so luscious and smooth and beautiful!! It may be my favorite part of this quilt. Maybe. So, the challenge has been met, one item is checked off the #sewmystash2016 list and I now have a bird quilt. 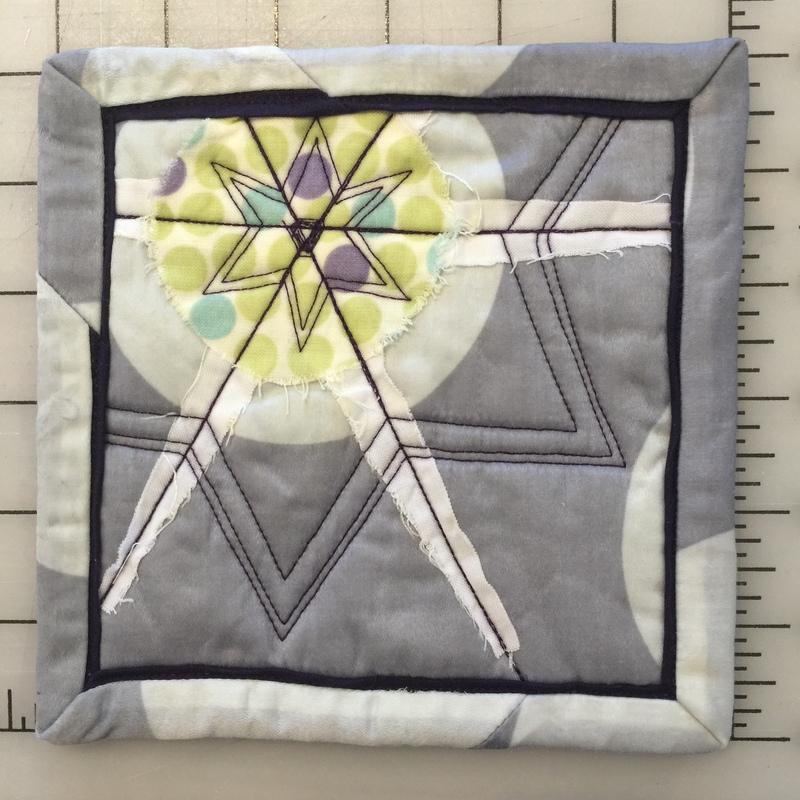 Project Quilting Season 7 kicked off earlier this month! I missed the first challenge (Confetti), but was able to get this little snowflake mug rug done today for the second challenge: Seasons. I knew that if it didn’t get done today, it wouldn’t get done. Plus I needed a winter mug rug for work. It’s about 6 x 6″ and the background and binding are made of Tula Pink’s Free Fall material. Padded thermo fabric was used as the batting. Since this is the first time I’ve done raw edge applique, I thought it would be interesting to see what it would look like washed. The frayed edges actually look kind of cool. There will be more of that happening around here. I also made a little bird mug ru g from the same fabric. 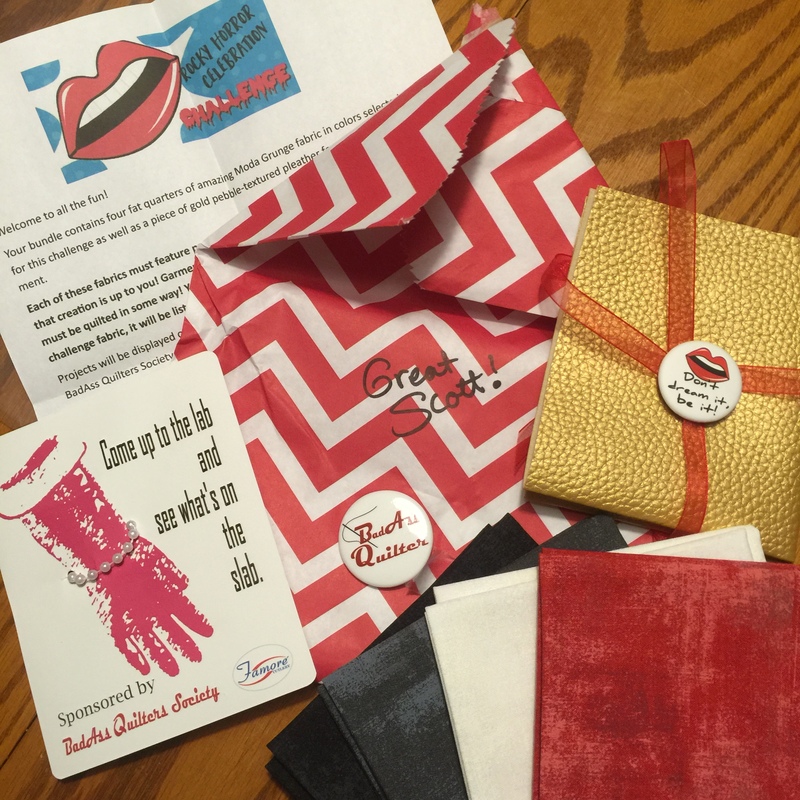 The fabric for the Rocky Horror Picture Show Challenge presented by the BadAss Quilters Society arrived in a fabulously wrapped little bundle! For the design, I’m collaborating with a local Rocky cast member and graphic artist. We are just beyond excited about this one and can’t wait to use that piece of gold.